"Essential. Could not have done it without them." Given the rivalry and infighting common between allies, that is high praise indeed. 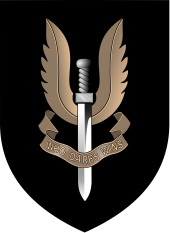 The Special Air Service is a special forces and counter-terrorism unit of the British army. It was founded by Churchill during the Second World War and entered the national consciousness during a daring 1980 raid on the Iranian embassy in London, where it freed 25 hostages under the glare of the media.The unit has been deployed in conflict zones across the world, including the Falklands, Northern Ireland, the Persian Gulf, Bosnia, Sierra Leone, Iraq and Libya. It has also been extremely influential in the development of most other developed nation’s special forces, including the US Delta Force. Perhaps more surprising is the fact that the SAS has managed to maintain its mantle as the world’s best elite fighting force at a time when Britain’s military might has otherwise ebbed. In fact, for a liberal western democracy to dominate in a field where mental toughness is the basic raw material is, in itself, intriguing. It seems part of this is down to excellence of process. The SAS has a 5-month selection procedure with a 90%+ fail rate. There is also a requirement for intelligence as well as brawn. Then there is the unit’s democracy. Yes, you read that correctly. It’s been called the most democratic military unit in existence, with every soldier having his say on most decisions. In a world of asymmetric warfare, the SAS’s role has only become more important. Their low-key approach, of small numbers of highly trained individuals dropping in to solve international problems, has proved radically effective, particularly in situations of hostage-release and enemy capture. One classic episode occurred during the wedding of Diana to the Prince of Wales, when Margaret Thatcher sent just two SAS men to foil a coup in Gambia and rescue the family of the President, who was also a wedding guest. The SAS duo picked up weapons and some paratroopers in neighbouring Senegal, crossed the border, secured the airport and broadcast stations, secured the capital and rescued the President’s wife. A decade later, under Tony Blair, the SAS were part of a devastatingly effective British mission that successfully liberated the people of Sierra Leone from a blood thirsty rampage by the West Side Boys. Who are you calling a soft power?